Can Redflow's home flow battery really beat lithium-ion? We asked that question last July after the startup, headed by internet entrepreneur Simon Hackett, debuted its zinc-bromide battery system for Australian homes. Redflow claimed it could compete with lithium-ion competitors on a kilowatt-hour basis due to higher lifetime reliability, longer discharges and faster charging. At least, that's what it found in lab testing. Real-world deployments are a different story. 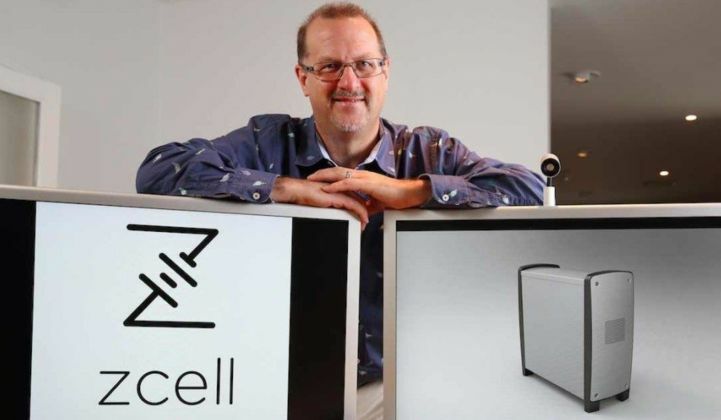 Nearly a year after launching the 5-kilowatt, 10-kilowatt-hour ZCell battery in the Australian market, Redflow is temporarily halting delivery of orders due to technical problems. The company issued a performance update on Sunday detailing issues with its first batch of storage systems. The note, written by CEO Hackett, provides a surprising amount of transparency into Redflow's technical challenges during the early rollouts. So far this year, 23 batteries have been repaired or replaced, said Hackett. Three batteries faced "minor mechanical issues" that were the result of manufacturing irregularities; 13 batteries were not cycling properly and "were resolved via software updates"; and seven batteries were replaced because they failed due to "unexpected stress." Hackett said that no other batteries had failed after the company issued a software patch. "Redflow has recorded some unexpected product failure modes from remote monitoring of batteries deployed at customer sites. Most of these problems were resolved on an ongoing basis via 'over the air' remote deployment of updates to battery software. Thus, lessons learned from 'real-world' customer deployments are being fed back into product improvement," wrote Hackett. Redflow is also dealing with electrolyte impurities -- a problem that could impact another 10 batteries. "Laboratory testing of electrolyte samples from one specifically identified batch of 10 batteries indicate that they may be at risk of failure due to the presence of impurities in [the] battery electrolyte," wrote Hackett. The company is halting any new battery deliveries until it finishes testing the electrolyte. It also submitted another 20 batteries to a testing lab, which could yield results within a couple weeks. It could cost AUD $500 (USD $376) per battery to eliminate the impurities in the electrolyte. In the nascent, thin-margin residential storage business where competitiveness is measured in pennies per kilowatt-hour, adding hundreds of dollars to the cost of each battery presents severe economic challenges. Redflow said it can resolve the problem with "improved supply chain controls." Redflow is in a particularly challenging spot. The company is betting that its zinc-bromide flow battery can compete in a world dominated by lead-acid and lithium-ion batteries -- technologies that are more familiar to investors and are supported at scale by the biggest battery manufacturers in the world. Lithium-ion batteries, the technology of choice for the new wave of residential storage entrants, are coming down in cost faster than predicted. "They're contending with folks like LG Chem, Samsung, Tesla, etc. who have much larger manufacturing capabilities and more proven tech in an already nascent market. This announcement is definitely a setback for a company already trying to punch above its weight class," said Brett Simon, an energy storage analyst at GTM Research. Redflow is one a few startups pursuing longer-duration storage for the residential market. Aquion Energy, a company with a sodium-ion chemistry designed for hours of residential storage, went bankrupt in March after raising $190 million in venture capital. Aquion was backed by Bill Gates and had a partnership with Green Mountain Power. After Aquion folded, CEO Scott Pearson reflected on the challenges of bringing the battery to market: "Creating a new electrochemistry and an associated battery platform at commercial scale is extremely complex, time-consuming, and very capital-intensive. Despite our best efforts to fund the company and continue to fuel our growth, the company has been unable to raise the growth capital needed to continue operating as a going concern." In an email to GTM, Hackett said his company quickly learned lessons about "some things that needed adjustment when our product hit the real world -- that's the essential point." Redflow released its performance update "out of a wish to be as open as we can be about the reality of getting genuinely new products to market," he wrote. "The very latest thing reported in that document is a straight supply chain issue -- one of the components that goes into the battery has had an issue with a contaminant that we’ve found in one batch of raw materials. So we’re dealing with it...and we think we’re on a good path to sorting it out soon." Redflow plans to offer more details on its operating path in the coming weeks. In February, the company hinted at a greater expansion into the telecom market. The company is reporting AUD $1 million in back orders so far. According to the technical update, Redflow has 96 residential batteries ready for sale and 120 batteries completed at the factory.